You probably already know that you can’t drink most beer due to it’s hops and glutenous ingredients. But hard liquor, especially vodka, may seem like a safe bet. These specialty vodkas are quite possible the best options when it comes to trying to find the perfect gluten free vodka for you to enjoy. If you’re allergic to gluten or Celiac, you’ve probably already know that you can’t drink most normal vodkas mainly because they have been distilled from glutenous grains. To some, it may seem like there are little to no options left. But thankfully you’re in luck because there are actually a number of grain free vodka’s for you to enjoy. Vodka believe it or not, is a very tricky alcohol for gluten free drinkers. You see, technically, during the distillation process of the vodka, the gluten proteins from wheat based vodkas is supposed to be removed. However, many people have claimed that these vodkas (made from wheat) still contain gluten, thus leaving them feeling sick and nauseous after consumption. So to be safe, you should aim to steer clear from all wheat based vodkas if you have Celiac disease or a gluten sensitivity, despite any claims of precise gluten protein removal. However, on the bright side, you can still opt for a non-wheat, potato, corn, or grape based vodka which are typically cleared for gluten free consumption. Below, you’ll find a listing of all the gluten free vodkas (and brands) that you can joy. But remember, some vodkas do come in special flavors, so it’s equally as important to make sure that those flavors are also gluten free. Typically there aren’t any issues with vodka flavors containing gluten, but it’s just a precautionary. So with that being said, let’s jump straight into this gluten free vodka list! Here are all the safe gluten free vodka brands that you can purchase and enjoy. Just click on the name and you’ll be taken straight to the liquor company’s main webpage. To see a listing of all the vodka brand’s flavors that are gluten free, click here. If you would love to get vodka and other hard liquor as well as wine delivered straight to your door in 30 minutes or less, be sure to check out our favorite alcohol delivery apps! Here’s a few answers to some of the most frequently asked questions about gluten free beer. Hopefully this helps! What is gluten free vodka made out of? Most vodka is made out of barley, wheat and rye. But unlike normal vodka, gluten free ones are made from either potato, corn, or grapes. What’s the gluten standard in vodka? In order to place a “gluten free” label on any bottle of vodka, it must by under 20 ppm, the FDA approval rating. However, some people still tend to feel sick after drinking any alcoholic beverages that have been distilled. So be sure to drink at your own risk. What gluten free vodka’s can I find in most restaurants? Typically in most table service restaurants, you’ll find Ciroc, Tito’s, Smirnoff, and UV, just to name a few. You can also find a great selection of gluten free hard liquors and beers as well. Is gluten free vodka more expensive than normal vodka? No, this type of vodka is not more expensive. Like most alcohol, the higher the quality, the higher the price (usually). Believe it or not some of the best vodkas are actually cheaper than the more expensive ones such as Belvedere and Grey Goose. What’s the best tasting gluten free vodka? According to most people, the best mainstream vodka in general is Tito’s Handmade Vodka. This even beat out Grey Goose (not gluten free) and Ciroc in overall ratings and rankings. Is Absolut Vodka, Belvedere, SKYY, or Svedka gluten free? No these brands do not sell any vodkas that don’t contain any gluten grains. Is Grey Goose gluten free? Although Grey Goose is made from wheat, the company claims that all gluten has been twice removed through distillation. Just because a vodka is made from corn, potatoes, or grapes, is it always going to be safe? No. One thing about some vodkas is that although the main ingredient may be corn, it could be mixed with other glutenous grains. So always be sure to read the labels or, or better, consult this listing. Where can you find vodka that’s safe for Celiacs and those with gluten allergies and sensitivities? You can easily find the vodkas listed above at most liquor stores. Only a few may have to be order from specialty shops or online. Thanks for reading and hopefully you enjoyed this ultimate, in-depth gluten free vodka guide and list. Please feel free to ask any questions or share any of your favorite gluten free vodka brands that we missed by leaving a comment below. P.S. Please share this listing with anyone that you absolutely know would love this list. Thanks! Need cheaper way to have fun… Any suggestions?? Three olives flavored vodkas are the only ones that are distilled from grapes. The original, vanilla & elvis ones are from wheat. Flavored vodkas are at a greater risk of having gluten than a wheat based unflavored vodka. The gluten protein molecules and their fragments are large heavy and not volatile. They are removed by distillation. 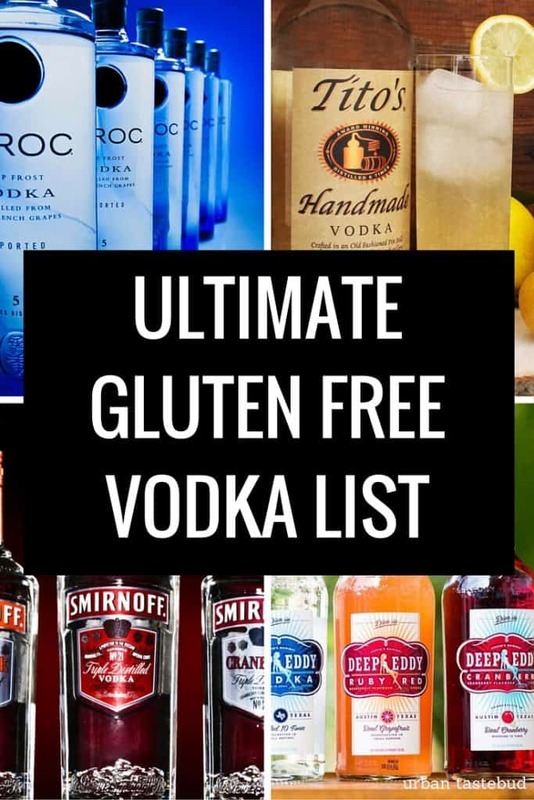 All unflavored vodka is gluten free. Gluten contamination only occurs through the addition of other flavors and colors post distillation or cross contamination. However vodkas made from grapes, corn and potatoes can be contaminated by gluten during post distillation processing as easily as those made from wheat. Three olives site says their naked vodka is made from wheat! So, I know Vitali Vodka isn’t the best vodka out there, but it’s cheap and I never get a hangover. That being said though, we are looking at going gluten free. Vitali is distilled from grain, but I can’t find information on which grain – corn, wheat, or rye? Do you have that answer? Is Seagram’s Sweet Tea vodka gluten-free? Cirrus Vodka, an award winning 100% potato based vodka produced in Richmond, VA is gluten free! Thank you for considering adding us. How can we get added to your list(s) and guides for gluten free vodkas. Our vodkas are named ZIM’S 81 proof and ZIM’S 59 proof and are both gluten and GMO free. Made with Polish potatoes in Wroclaw, Poland. Sirena de Chiloe is another gluten free vodka. It is made in Chile. All distilled spirits are gluten free. The distillation process removes any proteins. Even if it’s distilled from wheat, distillation involves the evaporation of alcohol from the mash (which definitely includes gluten if it’s made from wheat). Once it’s evaporated from the mash, even on the first distillation, it becomes gluten free because there’s no way for proteins to evaporate with it. Most decent vodkas are distilled at least three times. NOT TRUE. I react to tripple and more distilled wheat vodka/spirits. Me too Your. Me too. Hi Adam! Great post–you really know your vodka and the amount of research you did for this blog really shows. Trust Me Vodka just moved to the distilled spirits neighborhood and are trying to make friends. The ‘Trust’ part of our name is about how our customers don’t just have to take our word that the vodka is gluten free or organic. Our vodka is certified gluten free, (even the facility) made from Idaho potatoes and tastes amazing. We have each batch tested, approved and print it on the label. We think we’d fit right in on your Ultimate List. Please let us know if you’d like to try the product! As Tallard Schranit said all Vodka is gluten-free. Please educate yourself about the distillation process. This post is just spreading misinformation. …And all these distilleries leaving comments trying to get put on ‘the list’… what a joke. I guarantee you they know better. Not all Vodka is gluten free. I don’t care what anyone says. I am gluten sensitive and can not drink any vodka made from wheat! Have tried the more expensive vodka’s to only feel horrible the next several days. Now I simply stick with Smirnoff, but be careful what you mix it with! Good article man – Thanks! Mr. &Mrs. T. For a bloody Mary. Or lemonade. Looking for gluten free vodka, but also no barley, rice, malt. I can only safely have a rye based drink. Any suggestions? You all need to consult the Celiac Disease Foundation in the alcohol debate. They state quite clearly that vodka regardless of the base fermentable ingredient is gluten free and have the science to back it up. I respect those that still seem to have a reaction to it however that reaction is not from the presence of the gluten peptide. One of my dearest friends has diagnosed Celiac Disease and consumes both vodka, gin, and whiskey with no adverse side-effects. You can’t distill Gluten…Humans are the worst. Ultra Premium Vural Vodka from Austria is also gluten-free! This is what is wrong with the internet. So much bad information out there, this article included. All vodka is gluten free. Distillation removes gluten. Period. That is science. As an aside, you say that vodka from wheat isn’t safe, then list grey goose on the list of gluten free vodkas, then explain that the company explained it is “twice removed” through distillation. What does “twice removed” mean? removed, then removed again? Its nonsensical. They distilled it. That removed the gluten. As it does for all vodkas. Thanks for creating this list! I found an interesting vodka in Ireland and can’t find any info. Sausage tree pure Irish vodka, lists contents as sausage tree fruit, nettles and Irish grain. Thanks for your help!